The early construction of the Great Bridge Bridge could hardly be called great by modern standards. At the time of the Revolutionary War, the wooden span crossed about 40 feet over tidal marshes and the Southern Branch of the Elizabeth River. It stretched about 10 feet wide. Greatness came from its commercial importance. The bridge connected colonists in the farming communities in southeastern Virginia and North Carolina with the growing commercial port in Tidewater. By the 18th century, a small village had grown around the bridge to support shipping and merchant traffic. Trade consisted of pitch, tar and turpentine from pine trees used for shipbuilding and repair in Norfolk, according to author and historian Elizabeth Wingo’s research. The British realized its strategic importance early in the Revolutionary War. The royal governor of the colony, Lord Dunmore, planned to seize key routes from the colonists and choke supplies to Norfolk. On Dec. 9, 1775, British troops massed near the south end of the bridge. Colonists’ troops came in far greater numbers at the north end, where they built dirt ramparts. In the morning, regular British infantry marched across the bridge in formation. Colonists stationed around the ramparts fired mercilessly, killing the British command er and wiping out dozens of redcoats. The battle lasted about half an hour, Wingo wrote. The British troops retreated and climbed aboard a ship headed back to Norfolk. Colonists won a decisive victory at Great Bridge. Modern travelers know the Great Road as Battlefield Boulevard. The modern Great Bridge Bridge is about 50 yards south of the original. 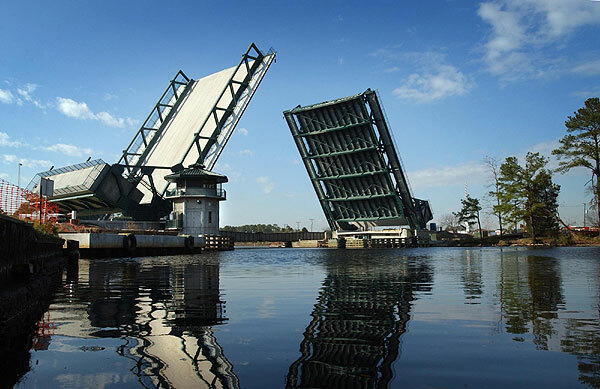 The green steel and concrete drawbridge carries four lanes of traffic over the Albemarle and Chesapeake Canal.